Google Analytics is useful to find information about your site's traffic, but it would be even more useful to gather stats for other sites you use to post your content online. For example, you might post videos on YouTube, upload photos to Picasa Web Albums and create documents using Google Docs. It would be interesting to link these services with Google Analytics and get access to a wealth of information about the number of views for each item, the time spent on a page, the referrals and more. Google already does this for Project Hosting: "To provide the most useful software to your users, you might want to know simply how many potential users have visited your project workspace, which countries they come from, which browsers they use, and which of your wiki pages they have viewed. Now all those questions can be answered. Project owners may simply sign up for Google Analytics and enter an analytics profile number into the project admin page. 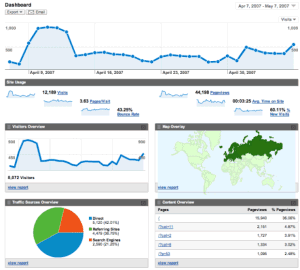 Tracking data can be viewed on the Google Analytics site about 24 hours later." This could solve a lot of user requests and make these services more personal and more useful. Scribd, a document sharing service I mentioned earlier this year, shows a lot of traffic data publicly, but I'm not sure if that's the way to go. Plus, they could integrate with AdSense. Why visit two tools? is there any way of integrating analytics with email, so that we can know when our mails are opened and how long and how frequent it has been read, is it been forwarded ?? already websites like didtheyreadit.com and readynotify.com provide these services .. but they charge ..
and u have mentioned that we can integrate with google docs.. how can we do that?? I didn't say that. This posts only includes some suggestions.